To those who accuse us of blind partisanship, we would suggest that the highest praise this blog has ever paid to an American politician was to President Harry S Truman. Truman loved the Constitution, read history and had a profound understanding of how a citizen in a republic, raised to leadership, should behave. As President, Truman made some of the most momentous decisions of the twentieth century. Truman also paid for all of his own travel expenses, vacations and food, and when he completed the job he was given to do, he and his wife got in their own car and drove themselves home to Independence, Missouri. No Secret Service followed them, nor did the Secret Service pay them tens of thousands of dollars in rent each month for the privilege of protecting them. Truman refused lucrative corporate and board positions saying "You don't want me, you want the Office of President of the United States, and that doesn't belong to me." Haley, who captured the governor's office preaching fiscal restraint, spent the (taxpayers') cash so she, her husband and the rest of the state's contingent could stay in five-star hotels; sip cocktails at the Paris Ritz; dine on what an invitation touted as "delicious French cuisine" at a swanky rooftop restaurant; and rub elbows with the U.S. Ambassador to France at his official residence near the French presidential palace. The South Carolina group also threw a soiree at the Hotel de Talleyrand, a historic Parisian townhouse where they feted foreign employers in hopes they'd set up shop in South Carolina. The Department of Commerce billed the $25,000 event as a "networking opportunity for members of the South Carolina delegation." "It was a great party," Commerce Secretary Bobby Hitt said in an interview last week. Expenses from the trip still are being submitted, Hitt said. The $127,000 figure represents spending only by the Commerce Department, which covered many but not all of Haley's expenses, he said. 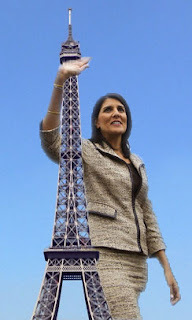 It probably gave Nikki Haley a moment of satisfaction to denigrate the reporter who wrote about her extravagant trip to Paris, but she actually did the voters of South Carolina a favor. Had Haley not made the cutting remark, revealing her lack of class, most voters would be unaware of her five star wining and dining at their expense. Harry Truman had the kind of hard won wisdom that most South Carolinians, indeed most Americans appreciate. He once observed that you can determine the measure of a person by the point at which things begin to go to their head. Truman never forgot where he came from, nor the fact that he was the public's servant, not its master.